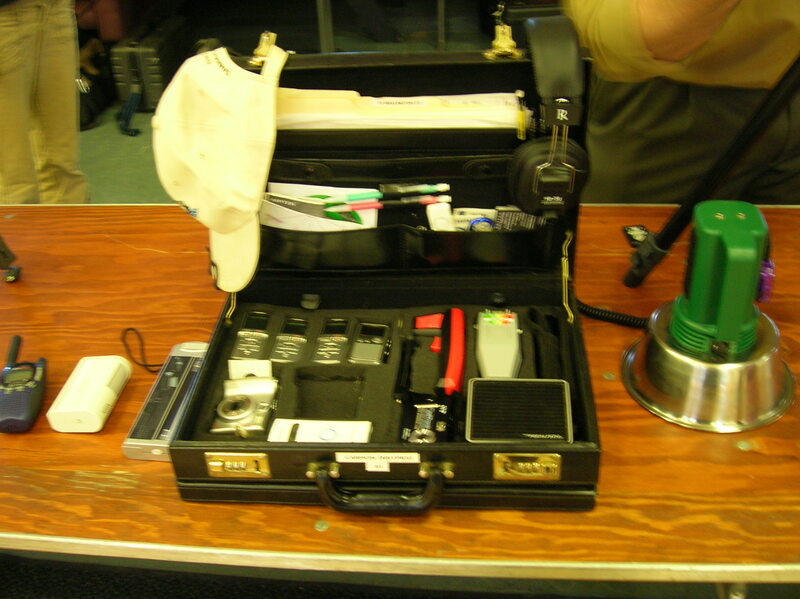 One of the big hits of the expo was the NNYPRS displaying and discussing the assorted tools and technology they use to investigate paranormal claims. I was lucky enough to have a corner behind their booth to rest at and while there I would watch all the people gathering around to learn about all the widgets they had out on display. I was impressed at how good they were at explaining what each thing did, how it did it, and why it mattered. I know that a lot of folks that read The Magical Buffet belong to their own paranormal investigation groups and/or have serious interests in investigating the paranormal, which is what has brought about the article you’re about to read. Brian Leighton, the head of the Northern New York Paranormal Research Society’s Tech Council, has agreed to share information about some of the tools (many of which are custom made) that he and his teammates use to investigate the paranormal. And he’s letting Buffet readers help him and the rest of the Tech Council decide what to discuss! Here Brian introduces himself and shares some quick thoughts with you. If there is anything you’d like to learn about, or have a tech question you want answered, just post it in the comments. Some NNYPRS tech from last year's expo! What is it all? These are the kinds of questions that will be answered! Well, I guess this is where I introduce myself. My name is Brian and I am the team leader of NNYPRS. I am also the head of our illustrious Tech Council. You may ask, “What is the Tech Council?” The short answer is it’s a bunch of big kids that love to let our inner geeks out to play. The long answer is basically it consists of several of our investigators who discuss theories related to the paranormal, and ways we can build or modify gear to test these theories. Now the Mistress of the Magic Buffet was crazy kind enough to allow us to contribute to her awesome site. So what are some of our theories? Well, one that we are actively working on is a better way to catch EVP’s. For people that don’t know, an EVP is an Electronic Voice Phenomenon; something that is caught on tape that isn’t heard when the recording was done. This is by far the most common form of evidence we collect while on investigations. Anyone can go out and purchase an inexpensive digital or analog recorder and with very little effort catch what may sound like an EVP. However, the big question is whether it really is an EVP. There are several ways that we can verify an EVP. They begin with the start of the actual session that we are recording. We take careful steps to eliminate any false positives by not allowing whispering. They end with careful review using software to view what frequency the recording took place in. Was it infrasonic (below the human levels of hearing) or ultrasonic? Here is a theory for you to ponder. Animals supposedly have the ability to sense the paranormal; their hearing also allows them to hear infrasonic sounds (lower than 20 Hz). Is there a connection? Animals can also hear ultrasonic as well. This is one connection we are trying to validate with our group. If you would like to learn more about the paranormal, please feel free to check out our website. Also, mark your calendars for October 16, 2010 to visit our annual Paranormal Expo in Plattsburgh, NY where our Tech Council will have our tools on display for all to see. Until next time, SEEK TRUTH!! !